GINX TV – WHAT WOULD IT TAKE TO OVERCOME ASTRALIS? Astralis have undoubtedly been the dominant team of the last few months in the top tier of international Counter-Strike. They may very well be the most complete side we’ve seen in some time. They’ve seemingly “figured out” CS:GO and appear to have most tournaments firmly under control. What might it take to dethrone them? How would a potential usurper overcome the Danish powerhouses? 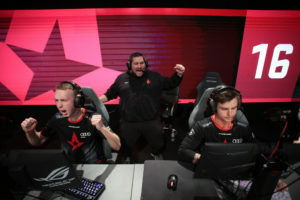 Their combination of a fundamentally sound tactical approach, unrivalled utility efficiency and the ability to frag well across all five players has made Astralis the best team in the world. You’d be hard-pressed to find anyone brave enough to refute that claim. Building on their tactical style, in-game leader Lukas “gla1ve” Rossander is one of the very best callers and probably the best fragging IGL in CS:GOtoday. Coach Danny “zonic” Sørensen is one of the best motivators you’ll see in the scene as well as helping guide and prepare the game’s most strategically diverse team. The zonic and gla1ve partnership helped take this team to greatness last year with Kjaerbye and has now repeated that feat in 2018 with the current lineup. Except for this time, they don’t look nearly as fallible as before. I mentioned their use of utility. There is no other team that does as much damage with grenades as Astralis. They’ve redefined the nade meta of CS:GO and forced the rest of the scene to play catch up in this area. With the FACEIT London Major looming on the horizon, somebody is going to need to rise to effectively challenge the Danes. The most likely candidates at this point in time are FaZe Clan and Na’Vi. Both teams have beaten them in important playoff matches this year. On the two most significant occasions it took both teams otherworldly effort and a little of the unexpected pull it off. GINX TV – WHO COULD STEAL THE NUMBER ONE SPOT FROM S1MPLE?